Happy New Year, everybody! (That’s the last time I’m writing or saying that I swear.) 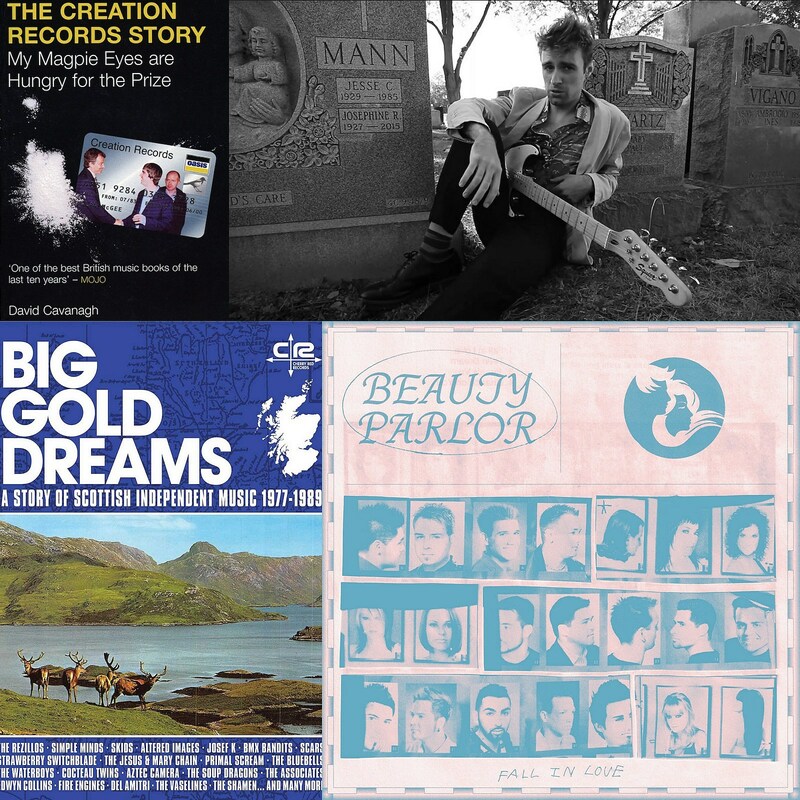 With the holidays falling mid-week, it’s a slow start to 2019 but we’ve got some some cool stuff this week: a new box set of Scottish independent music from the ’70s and ’80s; jangly new Texas band Beauty Parlor that features members of Fungi Girls; Mick Trouble has a new video directed by Ben from Bodega; a tribute to music writer David Cavanagh, who died last week and wrote great books about Creation Records and John Peel; and one last bit of looking back at 2018. We lost music writer David Cavanagh last weekend which was a real blow to anyone who likes smart, thoughtful, insightful, in-depth criticism and journalism. He got his start in the late ’80s but really came into his own in the ’90s when he was an editor at Select (probably my favorite music magazine ever) and he went on to write for Q, Sounds, MOJO, and other respected publications. (His feature on Echo & the Bunnymen in the August 2018 issue of MOJO is a fascinating, somewhat heartbreaking must-read.) David will be seriously missed. In addition to his many articles, he wrote books, too, including a great one on the late John Peel that looked at his life and the world via 265 episodes of his BBC radio show. Even better, I think, is The Creation Records Story: My Magpie Eyes Are Hungry for the Prize which looks at the rise and fall of Alan McGee’s record label that began in the ’80s with scrappy, jangly indie bands that became, improbably, a juggernaut thanks mainly to Oasis before crashing and burning at the end of the decade. Cavanagh spent nearly three years researching, interviewing and writing the massive 600-page book, which came out only a year after Creation went belly-up (an event that nicely provided an end to the story). The sprawl encompasses not just the most (in)famous stories surrounding the label — Oasis fame/fights/hubris, My Bloody Valentine nearly bankrupting Creation, Primal Scream, cocaine and booze, selling half the company to Sony, McGee becoming friendly with Prime Minister Tony Blair, and more — but also the history of UK independent labels in general. It’s not just a great book on Creation, but also a great book on Postcard Records, Cherry Red, Television Personalities, The House of Love, life in Glasgow in the mid-’70s, London during the Britpop era, and more. The way Cavanagh connects the dots is impressive and engrossing for even casual fans of this music. One caveat to me recommending this and a thing i didn’t notice till I got to this point: it may be because of Cavanagh’s passing, but The Creation Records Story is going for crazy money (around $100 for the paperback). I picked up a used copy in 2017 via Amazon for $20, so maybe set an alert and check back in a couple months. Maybe by then someone will have also made an e-book of this. The John Peel book — which is great as well — is still in print. Speaking of Glasgow, Postcard Records, Creation Records, Cherry Red Records, and jangly indie bands, all of those things are represented on this new five-disc box set that focuses on Scottish independent music from 1977 to 1989. Named for the great 1981 single by DIY postpunks Fire Engines, the box features most of the bands you’d want on a collection like this, including two bands Alan McGee was in (Biff Bang Pow, Revolving Paint Dream), The Jesus & Mary Chain‘s Creation single “Upside Down,” Primal Scream, The Soup Dragons, Joseph K, The Cocteau Twins, The Vaselines, The Shamen (before they became a rave act), Skids, Altered Images, Shop Assistants, Scars (“All About You” is a personal fave), Johnny & The Self Abusers (the punk band whose members went on to form Simple Minds, who are on here too), The Pastels, Strawberry Switchblade, Momus and a whole lot more. Related but not really related: There’s a documentary called Big Gold Dream that’s about Scottish post-punk which you can rent on Amazon. Longtime Indie Basement readers surely recall Mick Trouble, the ultra-obscure early-’80s cult artist that turned out to actually be Jed Smith of Brooklyn indie vets My Teenage Stride. The EP, an homage of sorts to Television Personalities’ Dan Treacy (today’s column has a distinct through-line! ), came out last year and is a wonderful record on its own even if you don’t get the reference points (which he 100% nails). My favorite track on the four-song EP is “Miss Margaret,” for which they’ve just made a music video. It was directed by Ben Hozie of Bodega and continues the myth of Mick, with someone who is not Jed pulling some Morrissey moves by the cemetry gates. It’s a nice, simple video (Ben’s got a future in this I say) for a great song and you can watch it and stream the EP below. While on the subject, My Teenage Stride recently released a new single. In keeping with the accidental theme of this week’s column, here’s a group from Fort Worth, TX who have probably listened to Orange Juice and bands from the early days of Creation Records. Beauty Parlor is the new band from Jacob Bruce, who is also in Fungi Girls who had records on HoZac and Group Tightener while they were still in high school. Fungi Girls, who still kinda exist, were on the garage tip, but had an indiepop side to them, too, that gave them a wise-beyond-their-years quality. Beauty Pill are much more on the indiepop side of things…as you may have guessed when I referenced Orange Juice. Their debut EP came out at the end of December and is both sparkling and hazy, cheerful and melancholy, and melodic throughout. The guitar playing is pretty stellar, chiming in that Smiths/Felt/Commotions kind of way where arpeggiated leads go throughout the songs, complimenting the bass parts and rhythm guitar while not getting in the way of the vocals (which are often male/female counterpoint style). I like this a lot. For those not sick of 2018 yet. Apart from Coachella, this has been a quiet start, news-wise, to 2019, so I thought I’d do one last (promise!) bit of looking back at last year. I posted my Best of 2018 lists last week, but I also make a bunch of mixes every year and thought I’d share those here. In addition to songs from all the artists on my EPs and LPs lists, these five mixes have songs from many of my Honorable Mentions, plus songs I really liked that either weren’t on an album or were on a record that I wasn’t otherwise that crazy about. The songs all segue together as is my controlling nature as a selector. Enjoy.